Part three of an infrequent series. Click here to go straight to the interactive tool. In previous free throw deep dives, I used SportVU ball tracking data to examine how launch angle and release spot affect free throw accuracy. 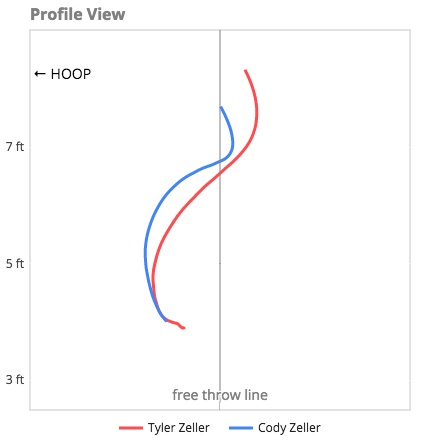 In this post, we back things up a bit, one second to be precise, and dive into the specific mechanics of each player's free throw shot. 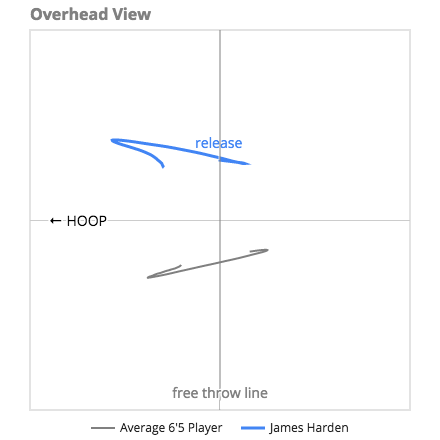 For this free throw analysis I focused on the motion of the ball (in all three dimensions) for the second prior to the ball being released. One second, while somewhat arbitrary, was chosen so that I'm capturing the natural shooting motion of the player after any pre-shot routine has been completed (e.g. one dribble, two dribbles, Klay Thompson's weird arm tap thing, etc.). The ball tracking data is messy, and shooting motion will vary from shot to shot, so I built a simple LOESS model for each player, with the goal of teasing out a player's typical shooting motion in all three dimensions. LOESS models are nice because they don't force you to shoehorn your data into a pre-determined type of curve (e.g. polynomial, exponential, etc.). Imagine you have courtside seats right around the free throw line and the hoop is to your left. The blue line above charts the path the ball will follow from your vantage point for the second prior to the release of the ball. The gray line is a benchmark of sorts. It is the path one would expect for an average player of Durant's height. 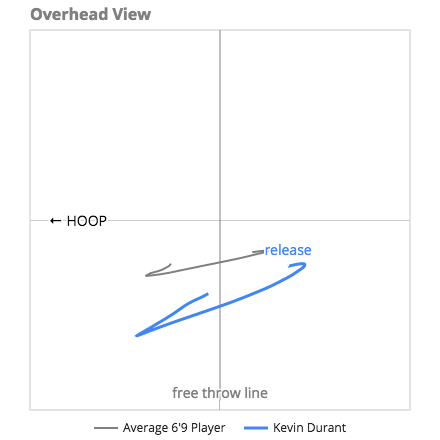 From the chart above, we can see that Durant's windup is much longer than average, which is not too surprising, given his above average wingspan. Perhaps more importantly, it was a good validation of my methodology. If the "windup" curves for most players looked similar year to year, it means I am measuring something real and not being fooled by noise. You can find these results for each player by clicking on the "byYear" tab of the interactive tool. 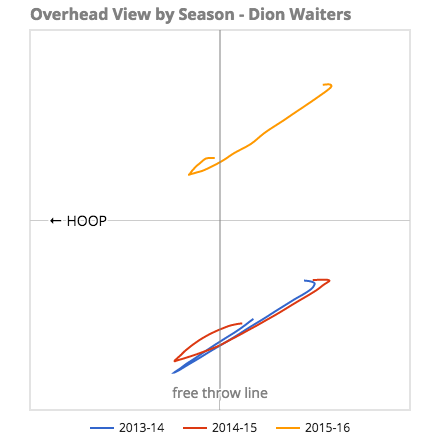 In a recent article for Nylon Calculus, fellow minutiae enthusiast Matt Femrite noted a peculiar pattern in Dion Waiter's free throws. He misses an abnormal amount of his second free throws after he makes his first, and he makes an abnormal amount of his second free throws when he misses his first. Wanting to stop the continual decline of his free-throw percentage, Waiters watched film of his technique in the offseason and noticed that most of his misses would go to the left. 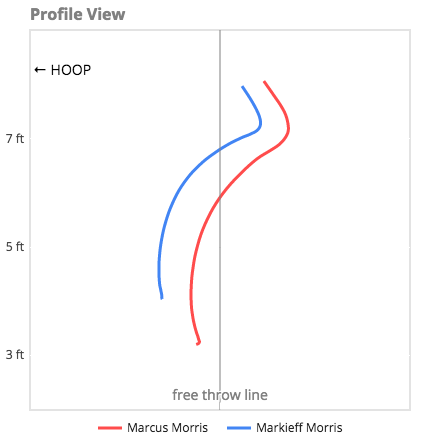 Believing that this was because of where he positioned his feet on the free-throw line, Waiters has decided to shoot his free-throws this season by standing as close to the right elbow as possible. This ranks players by how much their actual windup differs from the typical windup for a player their height. 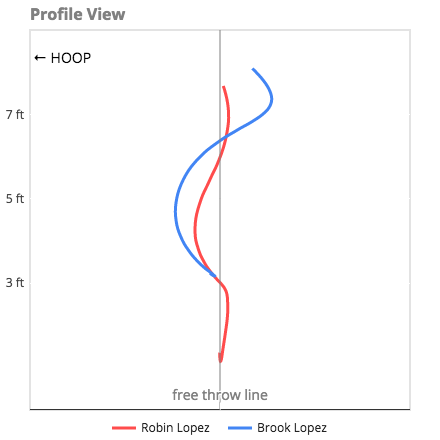 It turns out that, by this measure at least, Robin Lopez has the weirdest free throw shot in the league. 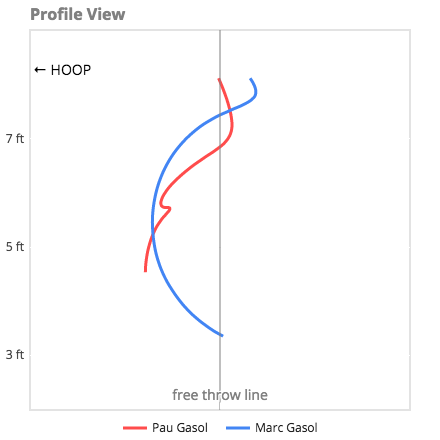 We also now have mathematical quantification of how ugly and peculiar Joakim Noah's free throws are. 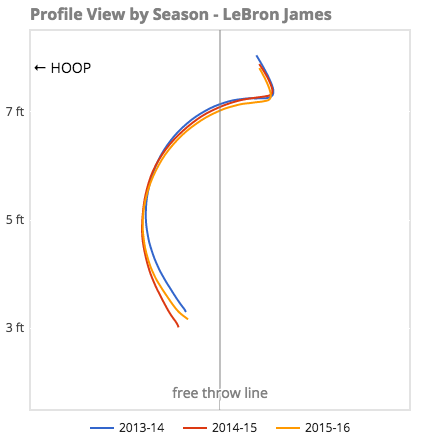 The table below shows the most conformist free throw shooters, but that's not nearly as interesting. This ranks players by how much distance the ball covers in the second prior to release. Once again, Robin Lopez tops the list here. 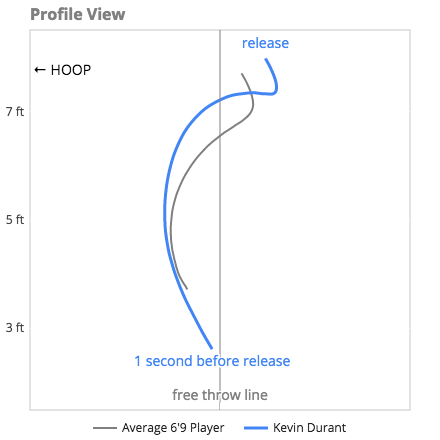 His free throw windup covers 7.08 feet in one second (Kevin Durant comes in second at 6.77 feet). Blake Griffin, with his odd free throw release mechanics, comes in second with a windup of 3.36 feet. Creating this list is how I (re)discovered Dion Waiters' shift to the right. Michael Kidd-Gilchrist is known for his peculiar shooting mechanics, and his struggles in correcting his form have been the subject of multiple articles. You can see those year to year struggles displayed in chart form here. Suggestions on additional ways to view/analyze/slice this data are welcome either here in the comments or on Twitter.